This Lovely, like new, two story executive fashioned home has five-bedrooms, three-baths, a fully furnished loft with TV/dvd, INTERNET area for the children, and features an over-sized deck. 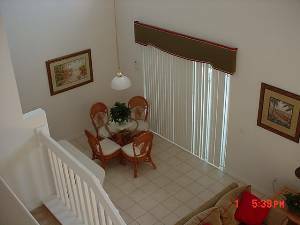 You will enjoy sitting under the coolness of your covered lanai, or swimming in your private pool overlooking a lake. 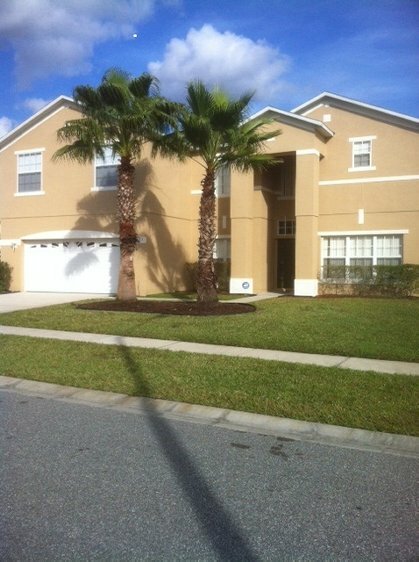 This spacious homei s located in Crescent lakes. There is ceramic tile throughout the kitchen and dining room, and the entire villa has upgraded furniture. 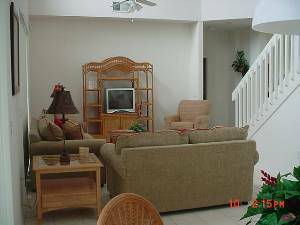 Many enjoyable extra features in this special vacation villa. 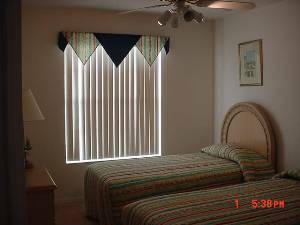 The bedrooms include a master bath ensuite, with KING size bed,(YOUR OWN TV) ONE queen size, one standard and two rooms with double twin beds each. 15 Minutes to Disney and all other major attraction. Wet n Wild Water Park, 20 minutes away. Shopping at the new Loop Center 15 minutes off of John Young and the Osceola Parkway. Home has been freshly painted. lovely to look at. WE HAVE WINTERER FOR THE LAST EIGHT YEARS IN THIS HOUSE. IT IS NOT ONLY A GREAT HOUSE BUT IS MANAGED BY AN OUTSTANGING MANGER. We had an amazing trip and the house was just what we were looking for. My grandson particularly enjoyed the TV in the kids bedroom. 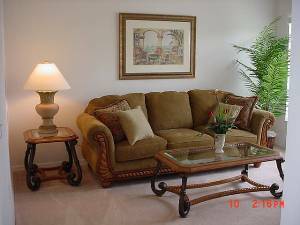 The house was spacious, well-maintained and clean. The furnishings were comfortable and not so fancy that I was worried about the kids damaging something. We were careful to remove our shoes and I truly tried to take very good care of everything as this is someone's vacation home. The proximity to Disney made it an easy trip and grocery stores were close. thanks so much for letting us visit Disney and have such a comfortable place to stay. THANKS FOR THE OUTSTANDING SERVICE,THIS HOUSE HAS BEEN IN IMPECKABLE CONDITION EVERY YEAR WE HAVE STAYED FOR THE LAST SEVEN WINTERS. COME EVERY NOVEMBER IN WISCONSIN WE START COUNTING THE DAYS FOR OUR RETURN TO THIS OUTSTANDING HOUSE. Thanks, Vera. We had a great time and were more than pleased with the accommodations. I will make time to write up a recommendation. And I will be in touch with you should we need accommodations for next spring. Rumor is my daughter’s team will be playing elsewhere over spring break next year, but I plan on visiting Kissimmee to umpire again. I may round up a few fellow officials to rent a house. If we do, I will be in touch with you. Thanks again for your service. We really miss Florida. It is currently 28 degrees with flurries here in Chicago. I worked a game at Valparaiso U. yesterday with the temperature at 34 degrees. Loved those 80s when we were in Fla. Thank you so much for giving us the opportunity to stay at Crepe Myrtle house. We had a wonderful time! 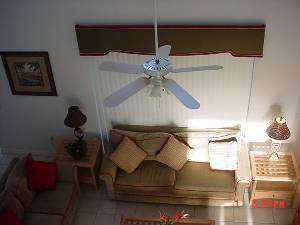 The house was perfect, and we are looking forward to contact you again for future vacations. Thank you. We truly did enjoy the house. Have decided that that is the way to go, no more hotels or resorts for us. Love the privacy. Thank you also for the quick response to the pool issue. Nice meeting your daughter, found out we are both from Illinois and only about 2 hours apart. Already trying to plan for next year so keep 5 bedroom ready for us. Once again Thank you for your help. Loved the 5 bedroom home, and view of the pond, will come back again. Very clean home. January 12, 2011 Reviewer: Pete & Melody B. Thank you for such a wonderful vacation home! We had a great time and it was so nice to relax by the pool after the kids had gone to bed. I wanted to let you know that we put the trash in the container and put it by the curb for the mornings pick up. Again, Thank you! Thoroughly enjoyed our stay at Crepe Myrtle. Beautiful! Vera, just wanted to let you know we really enjoyed our stay. The view of the pond with all the ducks, cranes and other water wildlife was such fun to watch. Thanks so much. Even though the weather was so much colder than normal it was still enjoyable to see the sun almost every day. thank you for giving me and my children a great five days in Fla. I will recommend you to all my friends and family. 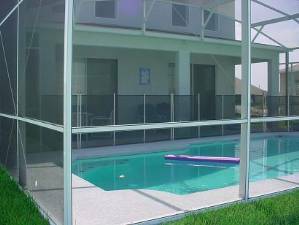 Email for special monthly rates, minimum 5 nites, $200 PER WEEK DEPOSIT, $300 DAMAGE DEPOSIT, REFUNDABLE. 13.5% state and local tax added to each reservation. 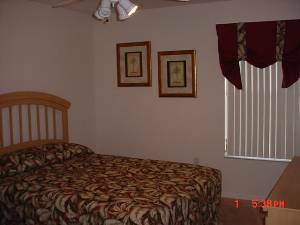 Small Pets welcome with additional $75 deposit. Deposit: We require a $100 deposit when confirming your booking and the balance 45 days prior to your stay. Cancellations and Refunds: We will refund the full amount if cancelled 45 days prior to your stay. Other Fees: 7 Night stay required. Required Stay: 7 night stay. Business Name: Gualano Assoc, Inc.